Is my child safety seat secured in the vehicle correctly? How tightly should a child safety seat be installed? How do I use a locking clip? Everybody needs a child safety seat, booster seat, or safety belt! There must be one safety belt for each person. Buckling two people, even children, into one belt could result in severe injuries. People who are not buckled up can be thrown from the vehicle or thrown around inside the car, seriously injuring themselves or others. Never hold a child on your lap! You could crush him/her in a crash, or the child will be torn from your arms. No one child safety seat is ‘best.' The ‘best' child safety seat is the one that fits your child and can be installed correctly every time. Children age 12 and under should ride properly restrained in the back seat. Each child safety seat needs a safety belt or LATCH system to hold it in place. 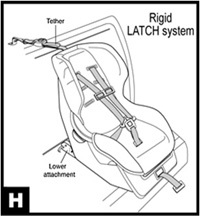 LATCH (Lower Anchors and Tethers for Children) is a system designed to make child safety seat installation easier. Check the child safety seat instructions and the vehicle owner's manual for tips on using a safety belt or LATCH system to install your child safety seat. If using a safety belt, put the vehicle safety belt through the correct belt path on the child safety seat (See Figure A). Check the child safety seat instructions or look for labels on the seat that mark the correct safety belt bath. Use the correct belt path for the direction the child safety seat is facing. The child safety seat must stay tight at all times. Check for tight fit by holding the seat at the belt path and by sliding the seat side to side and forward. To check for tight fit, by grasp the child safety seat at the belt path and attempt to slide it from side to side and forward. The child safety seat should not move more than one inch sideways or toward the front of the vehicle. To do its job, a child safety seat must be held tightly against the vehicle seat back. If the lap part of the safety belt is not tight or the child safety seat slides around on the vehicle seat, the child may not be protected by the child safety seat. 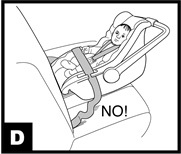 ALWAYS read the instructions that come with your child safety seat and your vehicle owner's manual. Both resources have valuable information to ensure safe use of child safety seats. If you cannot attach the seat tightly, contact the child safety seat or vehicle manufacturer customer service number for help or contact the U.S. Department of Transportation Auto Safety Hotline at 1-888-DASH-2-DOT (1-888-327-4236) or www.nhtsa.dot.gov . Click here to find a Certified Child Passenger Safety Technician in your area. WARNING: The back seat is the safest place in a crash. Children age 12 and under should always ride properly restrained in the back seat. Infants riding rear-facing must NEVER be placed in front of an active air bag. Infants must ALWAYS ride facing the rear of the car. The lap part of the safety belt must hold the child safety seat firmly in place. Place the safety belt through the correct belt path and pull the safety belt all the way out (See Figure A) . After pulling the safety belt all the way out, pull all of the slack out of the lap part of the safety belt. To make it tight, push the child safety seat down into the vehicle seat cushion with your body weight, and pull all the slack out of the lap part of the belt (See Figure B) . 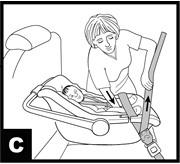 Feed the safety belt slack back into the retractor while your body weight is still in the child safety seat. Push down on the child safety seat with your body weight to get the safety belt really tight. 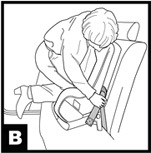 Grasp the child safety seat at the belt path and attempt to slide it from side to side and forward. The child safety seat should not move more than one inch sideways or toward the front of the vehicle. See Figure C) . If the safety belt loosens or the child safety seat slides forward or sideways more than one inch, the child may not be well protected. You may need to use a locking clip or try another seating location in the vehicle. Put the safety belt through the correct belt path on the child safety seat and buckle it (See Figure A) . Push down on the child safety seat (See Figures B and C) . Pull up on the shoulder portion of the safety belt until the lap portion of the safety belt is pulled tight. Hold the two parts of the safety belt together at the safety belt latch plate and unbuckle the safety belt. Put both parts of the safety belt through the locking clip, close to the latch plate (See Figure E) . Buckle the safety belt again. If you put the clip on correctly, the safety belt will now stay tight around the child safety seat. Remove the locking clip whenever the belt is not holding a child safety seat in. WARNING: This is the ONLY way a regular locking clip that comes with most child safety seats may be used. Using it any other way or on any other type of safety belt can cause serious injuries. If your safety belt locks, you do not need a locking clip. Check your vehicle owner's manual to see if your safety belt locks without a locking clip. 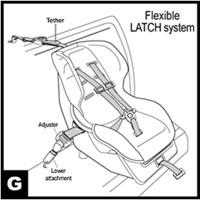 The LATCH system is designed to make child safety seat installation easier. 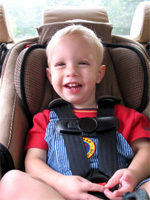 The LATCH system is required on all child safety seats and in all vehicles made after September 1, 2002. With the LATCH system, the vehicle safety belt is not used unless recommended by the manufacturer. Vehicles will have a top tether anchor and two lower anchor points. The lower anchor points can be found between the vehicle's seat cushion and the seat back. Most newer child safety seats will have a top tether strap and all will have two lower attachments. 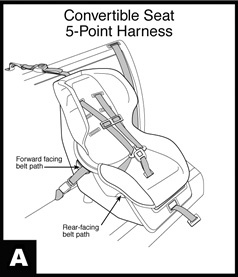 The lower attachments are hooks or connectors attached to straps (flexible) or part of the child safety seat frame itself (rigid). Flexible attachments have adjusters to tighten the straps. To check for a tight fit, grasp the child safety seat at the belt path and attempt to slide it from side to side and forward. The child safety seat should not move more than one inch sideways or toward the front of the vehicle. For a forward-facing child safety seat, you should use the lower anchors and a top tether OR a safety belt and a top tether. You never use both the lower anchors and the safety belt unless recommended by the manufacturer. When your child is rear-facing , only use the safety belt or lower anchorage system to install the seat. 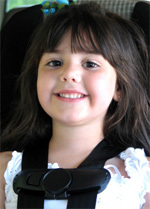 Very few rear-facing child safety seats also use a tether strap. Check your child safety seat instructions to see if your rear-facing child safety seat can be used with a tether. ALWAYS read and follow the child safety seat instructions and the vehicle owner's manual! 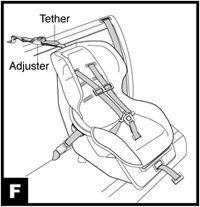 A tether is a strap that connects the top of a child safety seat to an anchor bolted to the vehicle's frame. A tether strap helps keep the child safety seat tightly installed and significantly reduces the risk of head, neck and spinal cord injury. Tethers can be used along with the vehicle safety belt or with the lower anchors of the LATCH System. Almost all passenger vehicles manufactured after September 1, 2000, and many late 1990's vehicles are required to have tether anchors. They can be located in many different places; check the vehicle owner's manual for instructions. Many older vehicles have holes pre-drilled above or behind the rear seat; some vehicles have pre-threaded nuts installed. Read the vehicle owner's manual for more details. 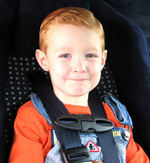 Properly install the child safety seat using the vehicle safety belt or LATCH system. Attach the tether hook to the correct anchor point in the vehicle; check the vehicle owner's manual. Pull the tether strap adjuster so that the strap is snug. Some tethers have a metal slide adjuster to tighten the strap. Follow the manufacturer's instructions carefully. WARNING: ALWAYS follow the child safety seat manufacturer's instructions for using the tether strap. Do NOT use the tether strap for rear-facing seats unless the manufacturer provides instructions to do so. Use ONLY designated tether anchor locations. Using anything else, could cause serious injury to a child.